Iams Proactive Health Adult Salmon cat food is a delicious recipe which contains only high quality ingredients that are designed to appeal to your cat's taste buds as well as provide them with all the nutrients they require to live a healthy adult life. It contains nourishment which provides support for seven key areas of a cat's health. Dried Chicken And Turkey (37%, A Natural Source Of Taurine), Maize, Wheat, Animal Fat, Rice, Salmon (4.1%), Sorghum, Dried Beet Pulp (1.9%), Hydrolysed Animal Proteins, Fructooligosaccharides (0.66%), Potassium Chloride, Brewer's Dried Yeast, Dried Whole Egg, Calcium Carbonate. Vitamin A (83273 Iu/Kg), Vitamin D (6783 Iu/Kg), Vitamin E (146 Mg/Kg), Trace Elements Contain Cupric Sulphate Pentahydrate (38 Mg/Kg), Zinc Oxide (228 Mg/Kg), Manganous Sulphate Monohydrate (138 Mg/Kg), Potassium Iodide (1.6 Mg/Kg),Basic Cobaltous Carbonate Monhydrate (5.2 Mg/Kg). 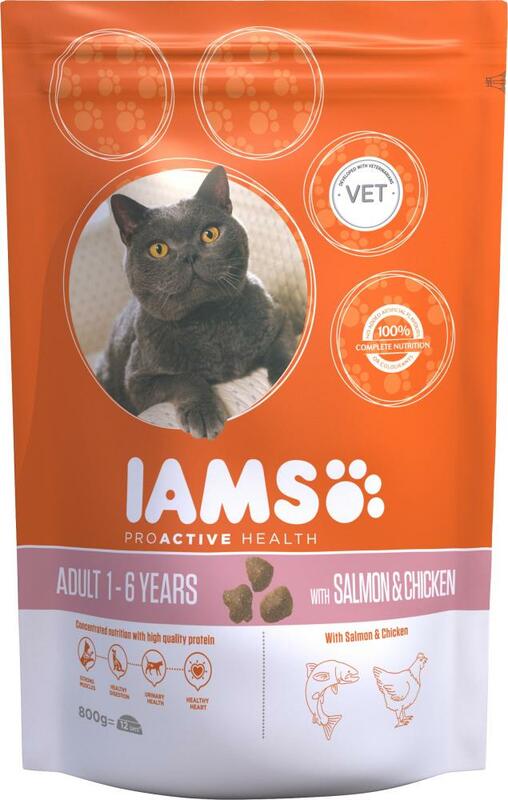 There are currently no questions for Iams Proactive Health Adult Salmon & Chicken Cat Food - be the first to ask one!